What an amazing feel good book. 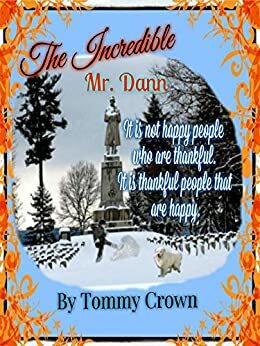 Tommy Crown has written another heartfelt story. This was so beautifully written; it warmed not just my heart but my soul as well. And just like his other two children's book, this book will tug at the hearts of children as well as adults. I absolutely love this book, and would highly recommend it as a Must Read. I can not wait to read more from Tommy Crown. 5.0 out of 5 starsMr. Dann is Incredible! Tommy Crown did it again! He captures your heart with his characters, you cant help but feel sad, happy,and hopeful for Pitt family. You will see the struggle they are dealing with. You meet the Incredible Mr. Dann and I have to say he is pretty amazing. This is a must read for anyone it is truly a make you feel good book. Just remember "It is not happy people who are thankful. It is thankful people that are happy." Love it Mr. Crown! 5.0 out of 5 starsAwwww!!! I loved it!! Miracles do happen! Tommy Crowns imagination has no boundaries! This is an incredible story and shows just because your down it doesn't mean your out. If you have a little faith the impossible can happen! This story made my heart warm. I love how his books teach amazing lessons that I feel some have lost sight of.